Sipí is a municipality in the Chocó Department. It was established on 1 January 1556 by Diego Marin de Avila. 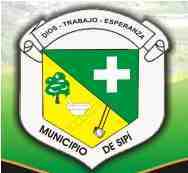 The flag of Sipí is horizontal green-yellow.